Yesterday (December 27, 2011) I went to SM North and Trinoma with my younger sister, Czarina (The Black Sheep Project). Her main purpose, actually, was to complete the stickers on her Starbucks card for a planner and, well, I'd be meeting up with some of my blogger friends. When my sister and I arrived at SM North, we went straight to The Block as I would be buying a hair color from Etude House. I'm actually planning on buying something red but they're out of stock already and I'm really itching on having a new color because my old color's going down my hair since my hair starting to grow already. So, I settled with the Sweet Orange shade. It costs P379. Definitely cheaper than having my hair colored in a salon and spend almost P3,000. Next stop was some new nail polish. 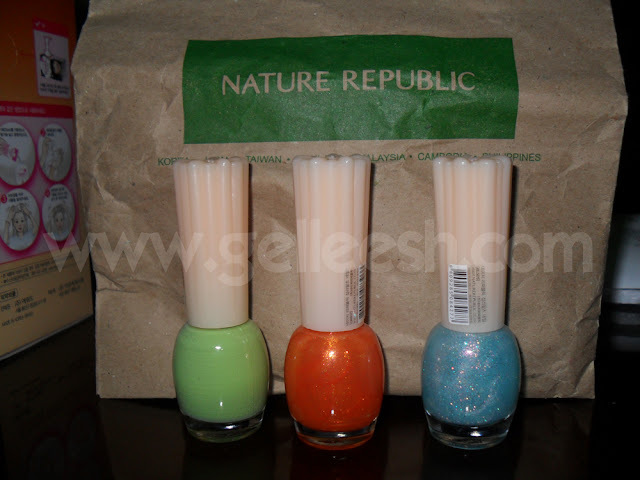 The cheapest yet one of the good polishes I know of are the ones from Nature Republic. They're P65 each so I decided to buy three colors. Actually, they do not last long; but what I like about 'em is that they're very easy to apply and they have big brushes. After buying some beauty products, we headed to Toy Kingdom to but our cousin, Patrick, a birthday present since he would be turning 13 this January 02. 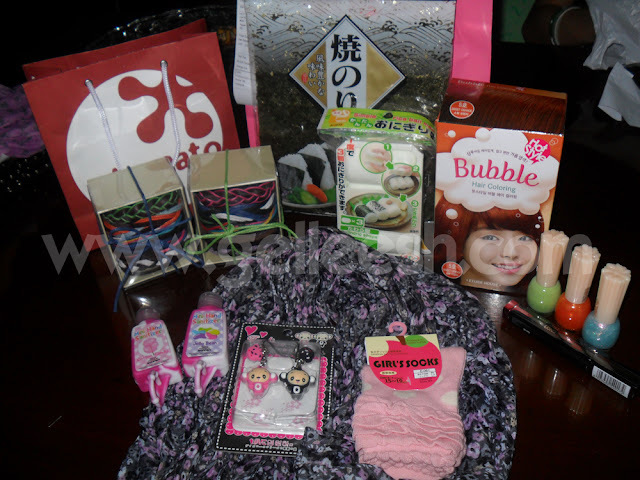 However, I won't be posting the gift here 'cos he might browse or take a peek in my blog. It's a surprise. Straight to Starbucks in SM North after for some coffee and my sister's stickers. I bought some potato chips from Starbucks and it cost P75. It's definitely worth it 'cos the chips were pure awesome! After our Starbucks session, we went to Trinoma and straight to Saizen to buy some stuff we would be using to make our Bento lunch boxes. And of course, since it's Saizen, you can't help but buy other stuff too. My sis and I bought a rice molder, dried Nori and matching monkey cellphone charms. Hers is black, mine is pink. 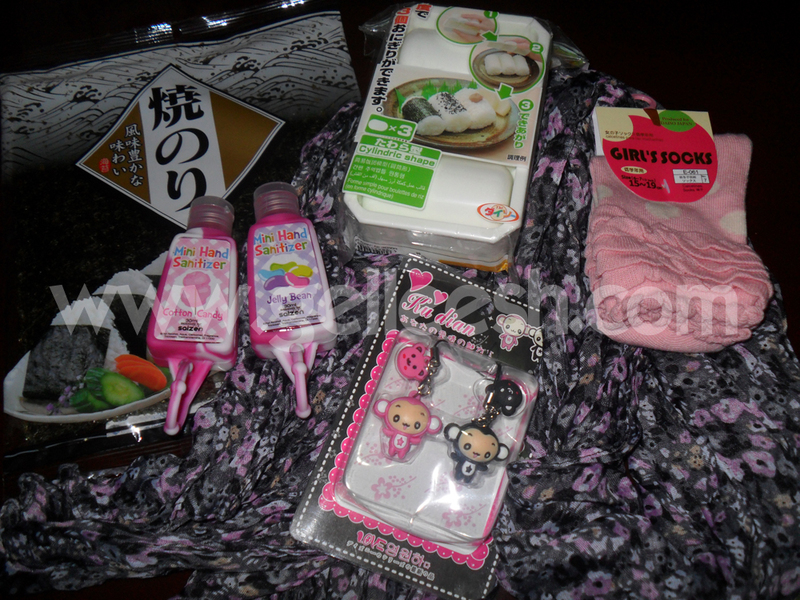 My sister also bought two hand sanitizers and I bought a scarf and a pair of socks. While we were going out of Saizen, we saw Kai (BrewOfTheDay.blogspot.com), Jen (ShopGirlJen.Blogspot.com) and the cutest Sofi! We went to dinner at BonChon and then we saw Sumi (ThePurpleDoll.Net) with her HS friends. Greeted each other and went on with our dinner. After dinner, we decided to go to Starbucks in Trinoma for some chika moments while waiting for Gie (ThirdWorldFashion.wordpress.com). 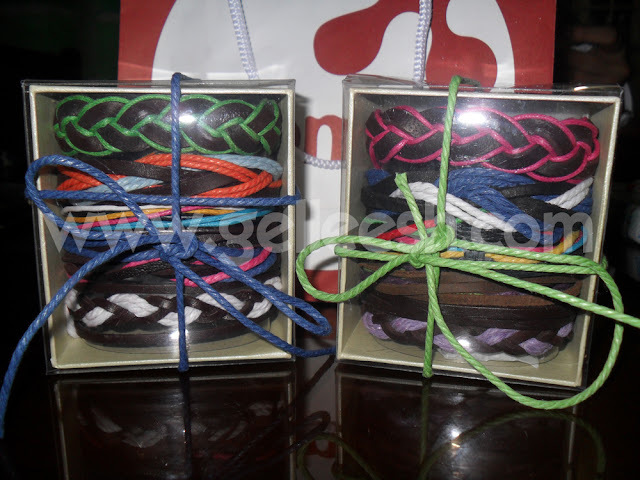 We passed by Tomato and my sister and I fell in love with their P200 worth bracelets; and thus, we bought them. When Gie arrived, we went to Beauty Bar to check on some cosmetics and then when we were about to go to Landmark to check out the acrylic lipstick rack Gie blogged about before, Landmark's closed na. Boo! So, we decided to just go to SM North Department store because Jen will be buying something from Fanny Serano. When we were looking at some makeup there, we saw Maybelline's stall and they're on 30% off. Gie convinced me to buy the Maybelline Stilleto Mascara. I got it for only P244 that time. After our purchase in SM Department Store, we went to GongCha for some milk tea but sadly, they closed 30 minutes earlier. BOO! So, as Gie, Je (Gie's bf), Kai, Jen and Sofi went on to look for other milk tea shops open, my sister and I decided to just grab a cam and go home. We were so exhausted but we definitely enjoyed the day. You really had a good buys on this things... 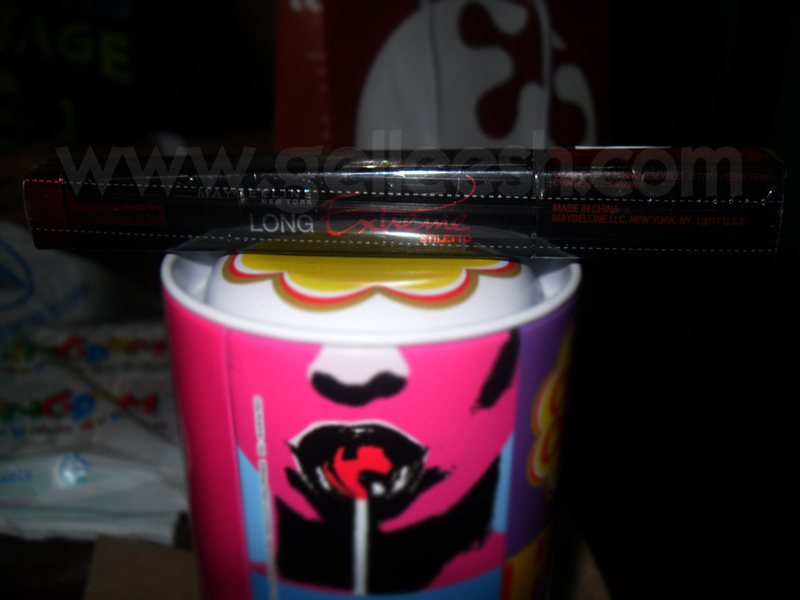 I like the 200php bracelets... super loving it! Loving all the things you bought! :) I have unflattering undyed roots na, so my hair is always in a bun. 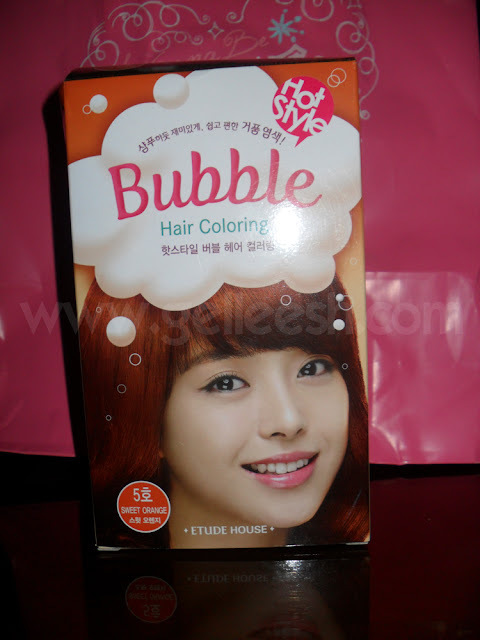 Didn't know Etude's bubble hair dye is cheaper than Prettia! Will definitely try it out too.. :) Btw, it was nice seeing you and the girls at BonChon. Sayang lang, our highschool mini reunion/bonding ended late na, 1am! >.< Hope I can hang out with you and the girls soon. Wow nagkita kyo ni Sofi? Mukang dibdibang shopping ang naganap! IMY!